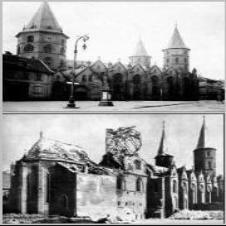 Jena was destroyed 15% by World War II bombs. River by a canal. Karlsruhe was founded in 1715 by Karl Wilhelm, Margrave of Baden- Durlach. homes, only 3,414 remained. 1,745 civilians were dead, and 3,508 injured. phosphorus burning was not reserved for the Grimm villains. historic buildings have survived are mainly outside the once lovely center of town. 15,000 were left alive," Jack Bell, Chicago Daily News Foreign Service, Kassel on May 15, 1946. Kaiserslautern was constructed from 1250-1350. Bavaria until 1918. After World War I, French troops occupied the Palatinate. Again. had run to shelters 243 times under the howling sirens. defenseless town, dropping bombs and machine gunning any moving object below. through the Middle Ages up to the 17th century. Jülich is first mentioned in Roman times as Juliacum. counts and dukes of Jülich extended great influence during the Middle Ages. modern military architecture in Germany, indeed in Europe. were simply blown up. There has since been some reconstruction. Bombers attacked Düren and Jülich; 180 British bombers hit Heinsberg. fortress, which it had ceased to be in 1860. 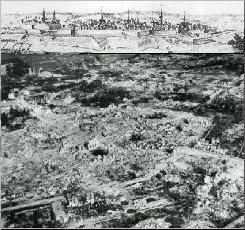 The goal was to destroy the alleged "heavy fortifications"
Heinsberg took heavy damage as well.